Is Spreading Democracy in Middle East a Bad Idea? The Bush administration has said that an Iraq with a freely chosen government could serve as a model for spreading democracy in the Middle East. But is that goal really in the United States' interest? A panel of experts debates. Is Spreading Democracy in Middle East a Bad Idea? An Iraqi woman shows her inked finger after voting at a polling station in December 2005 in Baghdad. Produced for broadcast by WNYC, New York. Ever since the 2003 invasion of Iraq, the Bush administration has said that one of its key rationales for overthrowing Saddam Hussein was that an Iraq with a freely chosen, representative government could serve as a model for spreading democracy in the Middle East. Iraq did succeed in holding elections, but the result was a government fractured along sectarian and ethnic lines that has been unable to act on vital legislation. A democratic election among Palestinians in Gaza and the West Bank produced a tumultuous government led by Hamas, which has been labeled a terrorist organization by the United States and Israel. Is it really in the United States' interest to promote free elections in countries where the most politically powerful groups may be fundamentally anti-American and undemocratic? That question was posed recently to a panel of experts in an Oxford-style debate, part of the Intelligence Squared U.S. series. 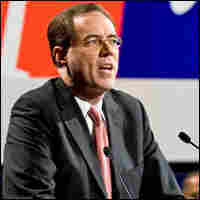 The debates are modeled on a program begun in London in 2002: Three experts argue in favor of the proposition and three argue against. In the latest debate, held on Sept. 18, the formal proposition was "Spreading Democracy in the Middle East is a Bad Idea." 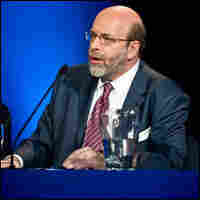 The debate was held at the Asia Society and Museum in New York City and was moderated by Robert Siegel, the senior host of National Public Radio's award-winning program All Things Considered and the radio host of the Intelligence Squared series. In a vote before the debate, 46 percent of the audience supported the proposition and 36 percent opposed it, while 18 percent said they were undecided. After the debate, the audience voted 55 percent in support, 40 percent against and 5 percent undecided. 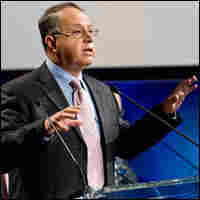 Flynt Leverett, a senior fellow at the New America Foundation and former director for Middle East affairs at the National Security Council, says: "The legacy of 20th century colonialism in the Middle East, oil concessions and all the rest, mean that it is not popular for regional regimes to cooperate with hegemonic power. While there is no evidence that democracy reduces the incidence of terrorism, there is ample evidence — from places like Egypt and Saudi Arabia — that holding more open elections in these and other societies would produce governments that are more anti-American than incumbent regimes ... The best hope for modernization, and ultimately liberalization, in the Arab and Muslim worlds today lies in incumbent regimes who recognize that, first of all, economic modernization is essential to their country's future." Hear excerpts of Leverett's argument. Dimitri Simes, the founding president of The Nixon Center and publisher of its foreign-policy magazine, The National Interest, says: "If ... in 1930s, we knew what Hitler would do to the Jews and to the others, would we allow him to come to power democratically? Wouldn't we consider stopping him a wise and honorable policy? And I completely agree with the Israelis now when they would not want to recognize democratically elected Hamas. And I do not care how many votes Hezbollah gets, but as long as they do what they do, we should judge them not by the process to which they came to power, but what they're doing to themselves, to others and what they present to the United States." Hear excerpts of Simes' argument. Shibley Telhami, the Anwar Sadat professor for peace and development at the University of Maryland and a non-resident senior fellow at the Saban Center of the Brookings Institution, says: "I think, if you look at what has happened over the past five years as a consequence of this policy of spreading democracy by force, is that we have a public and Arab world that doesn't believe us ... we have less democracy, more anarchy, more instability, more terrorism — and even worse, the growing American dependence on the very institutions and the very governments that need to be reformed. In essence, we have given democracy a bad name. It is hard for people in the region, including people who badly and desperately are looking for democracy and freedom, to think of democracy and freedom the American way without thinking about the horrors of Iraq." Hear excerpts of Telhami's argument. 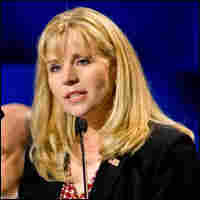 Liz Cheney, former Near Eastern affairs principal deputy assistant secretary of state and coordinator for broader Middle East initiatives at the U.S. State Department, says: "For decades the terrorists have known that they can prey most effectively in societies where young people ... have no hope for a better future here on Earth — in societies that are characterized by brutal, autocratic regimes... For too many years America perpetuated this status quo. We supported those authoritarian regimes, we ignored the aspirations of their people. This policy, essentially the one that our opponents would have us return to tonight, brought only a false sense of security and stability ... Our opponents argue there is no evidence that democracy combats terror. To make this argument, you have to ignore the words of the terrorists themselves. If you read the captured letters of former al-Qaida in Iraq chief Abu Musab al-Zarqawi ... you will see, in 2005 he wrote, quote: 'We have declared a bitter war against the principle of democracy and all those who seek to embrace it.'" Hear excerpts of Cheney's argument. Danielle Pletka, vice president for foreign and defense policy studies at the American Enterprise Institute, says: "When students who want to vote step into the streets of Cairo they risk arrest and torture. ... These victims of Middle Eastern oppression are the ones who provide the oxygen that enables al-Qaida to operate and it gives resonance to their political messages. ... There is clear evidence that jihadists flourish where dictators rule. In supporting the PLO, what did we do to rid Gaza and the West Bank of Hamas? In supporting Mubarak, what have we done to rid Egypt of the Muslim Brotherhood? 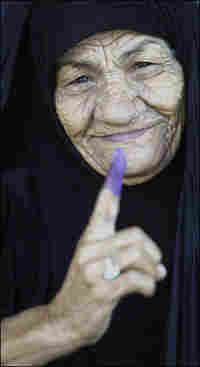 Sixty years of rooting for the dictator's stability ... didn't protect us on 9/11." Hear excerpts of Pletka's argument. 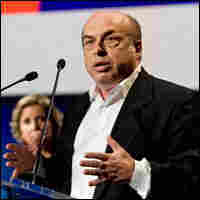 Natan Sharansky, the director of the Adelson Institute for Strategic Studies at The Shalem Center in Jerusalem, says: "When you defeated Germany and Japan in the Second World War, you spent enormous efforts — economical, intellectual, financial — to support, to promote democracy, and today Japan and Germany is not a threat. Take Russia. When Russia was part of the totalitarian Soviet system, it was your worst enemy. When Soviet Union fell apart and Russia went towards freedom, it almost became your ally. Today, when freedom is there in retreat, in a big retreat, it becomes again a threat to America. ... You take North Korea, you take Iran ... whenever there is a threat to America it means that democracy is there, in retreat." Hear excerpts of Sharansky's argument. The Intelligence Squared U.S. series is produced in New York City by The Rosenkranz Foundation and for broadcast by WNYC.